Guy Franklin tracks the growing Israeli startup scene in his spare time. "Startup Nation" actually breeds a lot of U.S.-based firms -- especially in New York City. About ten new Israeli startups are added to the New York community every month, a trend Guy Franklin has been noticing for the past six months. Franklin works as an accountant at Ernst & Young but tracks Israeli startups in his spare time. 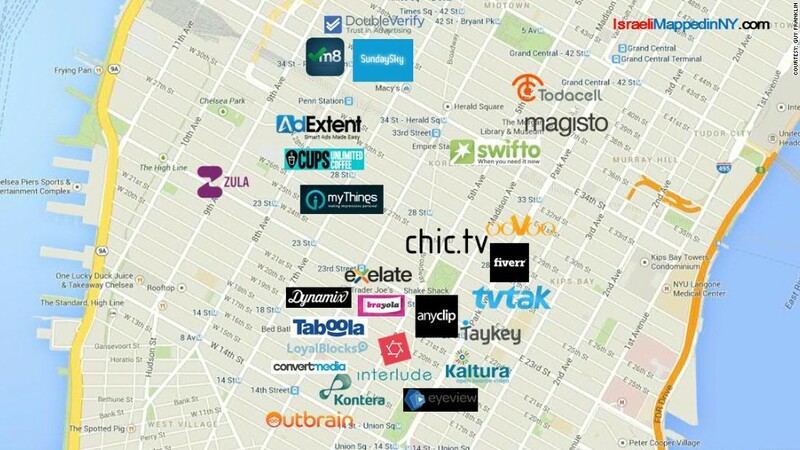 When he started Israeli Mapped in NY in 2013, there were about 60 Israeli startups in New York. Now there are roughly 200. Israel has the highest density of tech startups in the world. There are currently 62 Israeli companies listed on the Nasdaq exchange (it's the third highest country behind the U.S. and China) with a combined market value of $36 billion. Israel also spends the highest percent of its GDP on scientific R&D, according to the World Bank (4.4% compared to 2.7% for the United States). This has made the country ripe for entrepreneurial ventures. And because Israel's tech industry has mirrored the broader sector -- shifting from hardware to consumer-focused products -- this necessitates moving closer to its global consumer marketplace. Establishing a U.S. base has become "part of the evolution" of Israeli companies, according to Nili Shalev, economic minister of North America for the Government of Israel Economic Mission. "Israel is a small country from a consumer perspective," explains Shalev. "[Companies] need to be near the customers to adapt the product to the market needs." New York doesn't just offer a mass of potential customers. Entrepreneurs have access to capital, a wealth of advisers and a shorter time difference to Israel than in the Bay Area. But all of Israel's tech talent had made for fierce competition when it comes to getting attention from investors and gaining traction among U.S. consumers. "The ability for startups to move from Tel-Aviv to New York and to successfully expand is becoming harder and harder," said Eyal Bino, who runs Worldwide Investor Network, an accelerator platform that helps early-stage foreign tech startups find mentors and funding in New York. Through WIN, Bino has worked with 58 startups in the past three years -- 23 of which were founded by Israelis. In March, he launched Accelerant, a micro fund for Israeli startups. The fund will provide a minimum of $500,000 to help companies grow their business -- from moving operations to New York to raising their next round of funding. Bino hopes to invest in two startups this year and estimates investing up to $20 million by 2018. Thanks in part to endeavors like Accelerant, Israeli startups are growing by at least the same rate, if not faster, than their homegrown New York counterparts, according to Danny Schultz, co-founder and managing director of Gotham Ventures. Schultz has been following the Israeli tech scene since the mid-1980s and said Israel has more startups in New York than any other country. This has helped the country's tech startups thrive (Outbrain), find buyers (Boxee TV, bought by Samsung (SSNLF); Adap.tv, bought by AOL (AOL)) and go public (Wix (WIX)). Franklin has all of them on his map, along with a few accelerators, like Accelerant. It's a loose count, as it largely depends on founders giving Franklin a heads-up to their existence. But it's such a tight network that he said he's usually pretty clued in to the movement. This month, he added Wanderant, a DIY travel planning startup; Circlezon, an app that manages all your social networks; and Switch, a job search network geared toward media and tech professionals. Each is vetted before going on the map, which he updates regularly. Though it's no small undertaking to stay on top of the growing tech scene, Franklin says he "enjoys every minute" of his project -- so much so that he launched Israeli Mapped in Boston less than a year ago. His motive? To change the conversation about Israel through the success of the country's startups.